Ward 14 at Walsall Manor Hospital is closed due to norovirus – visiting is restricted! Call 01922 721172 ext. 6731 to arrange visiting a friend or relative who is critical ill or End of Life. New ICU now open. Follow the latest updates and view the gallery. 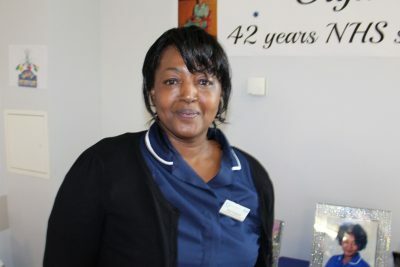 Best wishes to Olga Ferguson, Antenatal Screening Coordinator, who retires today after 42 years in the NHS! Care excellent, clinic staff brilliant, no problems at all, would recommend it to anyone, first class service. Thank you very much. Staff couldn’t have been better and they treated me really well. Very compassionate nurses. Thank you for looking after me and my wife. Excellent service, very professional staff. Very hard working and all lovely girls. The care provided was excellent. The staff were very approachable and really lovely. Staff were extremely attentive and caring no matter what the issue was they’d always assist. Extremely helpful and kind, spotless surroundings. Extremely satisfied. Thank everyone concerned. Doctor excellent. Efficient and puts patient at ease and very polite. Nurses efficient and kind. It was very quick and the staff were pleasant and reassuring. Excellent service, taking time and effort to support my child while having her blood test.